I know this is a long shot but does anyone have the link to this multi chapter unfinished story? It is about the X files finding out that there are other life forms and that they finally believe what Mulder was telling all this time. There's like a virus or something going around that has males being able to be come pregnant, have powers, become Neanderthals, Clairvoyance, and some others. The female population dwindling due to this virus. Skinner becomes like the King of the earth and is in a relationship with Mulder as well as Krycek later ons. Lot's of people; Russian man Nikoli (I think), Seraphim King, Neanderthal Henderson and others getting it on with Mulder and Mulder having a few or so kids. Found. It was Life from the Ashes series. In case you haven't heard about it yet - there's a xf_bigbang in the making and people over there are still looking for artists and writers. They have already lots of MSR writers, so some more slashers would be great! The X-files recs/fic-finding community is open to all X-files related searches. --het, slash, and gen are all fine.-- Meta, kink mems and comment challenges are also allowed. As I said this community is open to..
*General recs searches like (please rec me some h/c fics)are also fine. This comm is open to all..just be polite and remember to use your tags. Summary: Set in the Touching Mulder Universe ( http://mysticdreamer32.livejournal.com/tag/touched%20by%20mulder ) but can be read on it's on. Summary: On a nice summer morning. Summary: Krycek pays a visit to Mulder’s apartment, and Mulder wants answers. Disclaimer: This so did not happen. AN: Written for the prompt His reasons why over at the Kiss Me/Kill Me Drabblethon. Summary: Their relationship blurred the lines between love and hate, life and death. Like to write? Love any of the shows on the FOX Network? Great! There is a new challenge, called fox_las, where you write a fanfic of at least 100 words every two weeks based on a different prompt. Then they get voted on and the person with the least votes is out that week and the person with the most is safe next week. Till you have one author standing who wins! What do you win? A snazzy graphic and a $10 GC to Amazon or Barnes & Noble. You don't even need to be a GREAT writer! Can someone tell me what happen to the themkshrine? Summary: Krycek and Mulder both deal with the events of “Anasazi” and their last meeting in their own ways and on their own. A/N: I’ve put a bathtub in Bill Mulder’s bathroom. There wasn’t one in the episode, but I put one there. I also made Mulder’s confrontation with Krycek happen right after the incident in said bathroom, simply for the reason that that’s how I remembered it when I wrote this, and then I watched the episode again and realized I’d remembered it wrong and couldn’t be bothered to change it. Take it for what it is! 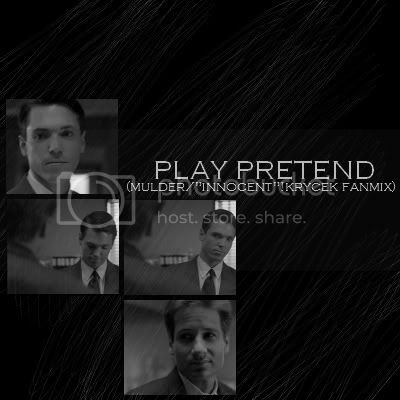 Will be X-posted to xfilesfics x_files_slash slashingmulder krycek_lives & The Basement.